﻿ KONcom – KONČAR Elektronika i informatika d.d. 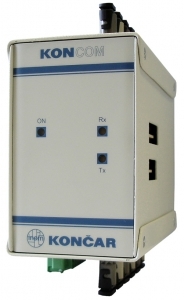 Unique name for the group of KONČAR converters used for the conversion of one communication interface to another. KONcom RS is a transducer of communication interface RS232 to RS485 or RS422, while the KONcom RSFO is a converter from RS232, RS485, RS422 or FO to 6 (5*) FO interfaces. Voltage isolation between interfaces is 2.5kV. RSFO includes the ability to work in “LIGHT_ON” and “LIGHT_OFF” working mode.